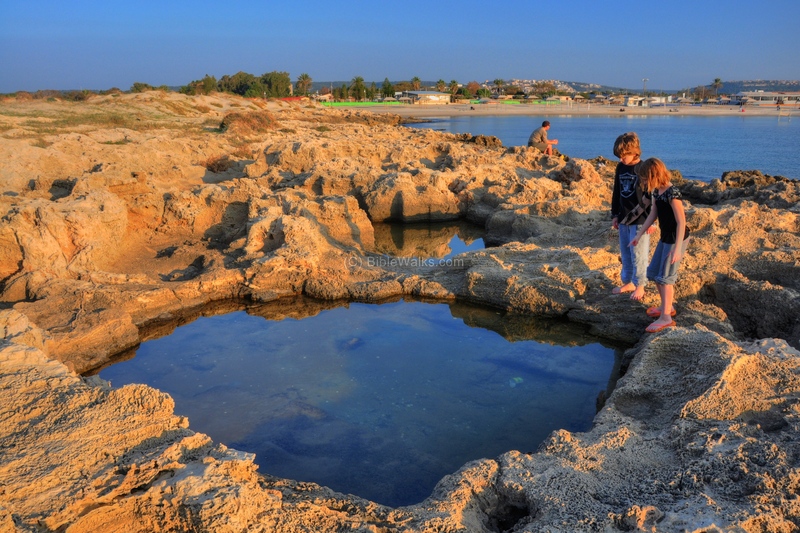 This web page shows a gallery of nature photos along the coast around Tel Dor. 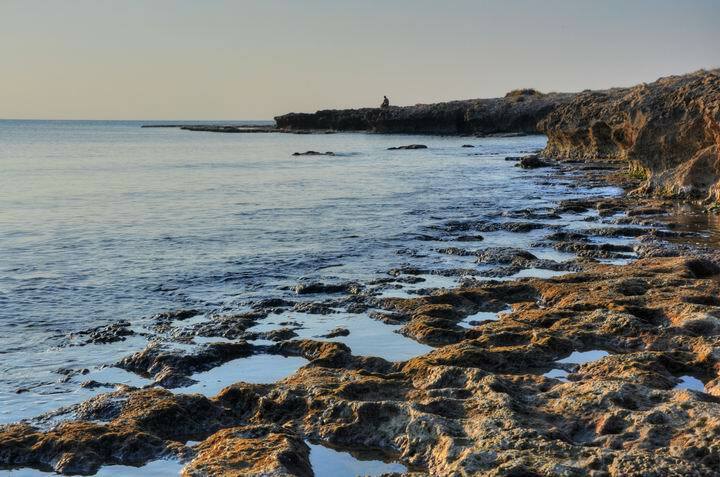 This is part of the marine nature reserve of Dor-Habonim. 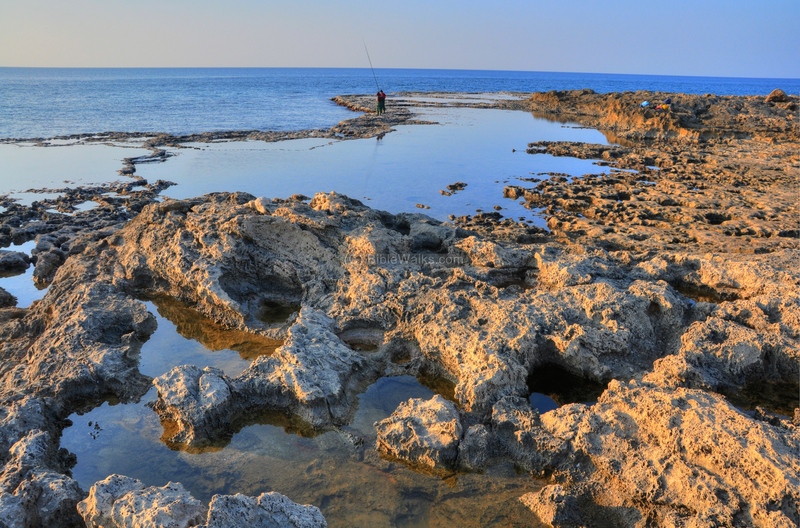 This web page presents nature scenes along the beach of Dor (Tantura), on the coast of Mt Carmel. It is part of the marine natural reserve of Dor-Habonim. The web page focuses on the beach front, on the area around the ancient port city of Tel Dor, which is detailed in another page. 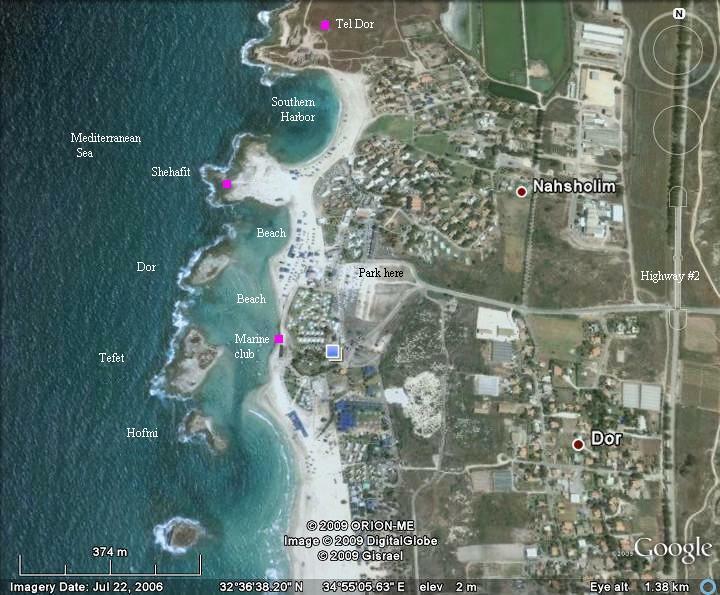 A map of the coast line south of Tel Dor is seen below. The major points of interest are marked by a purple marker. You can point on these points to navigate to a photo gallery of that section. The Shehafit (tern bird) islet is the northest island, located on the southern side of the ancient bay of Tel Dor. The photos below are ordered clockwise - starting from the southern side and completing at the eastern side. A view from Dor shore to Shehafit islet is seen below. 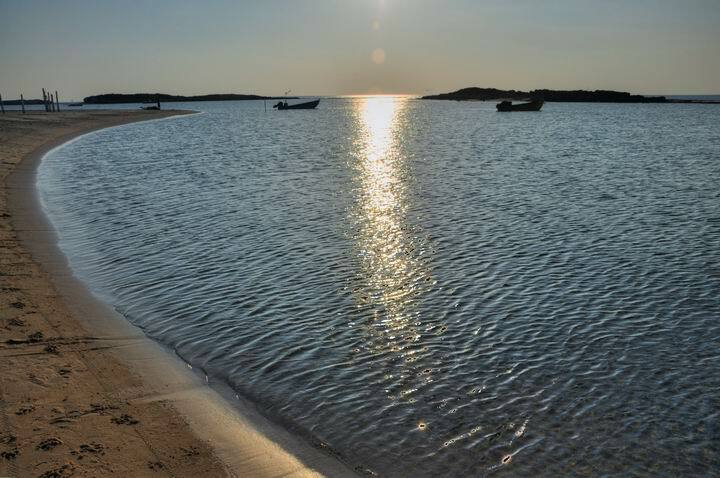 This sandy beach is a great summer time swimming site, and in the winter time (December timeframe) its a great place for hiking. 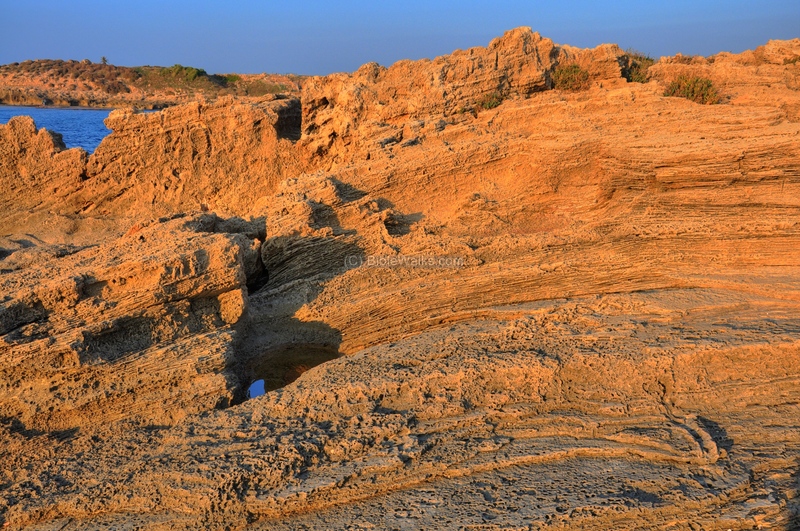 The islet is made of calcareous sandstone (Hebrew: Kurkar) rock, which was shaped by the seas, sun, winds and man. 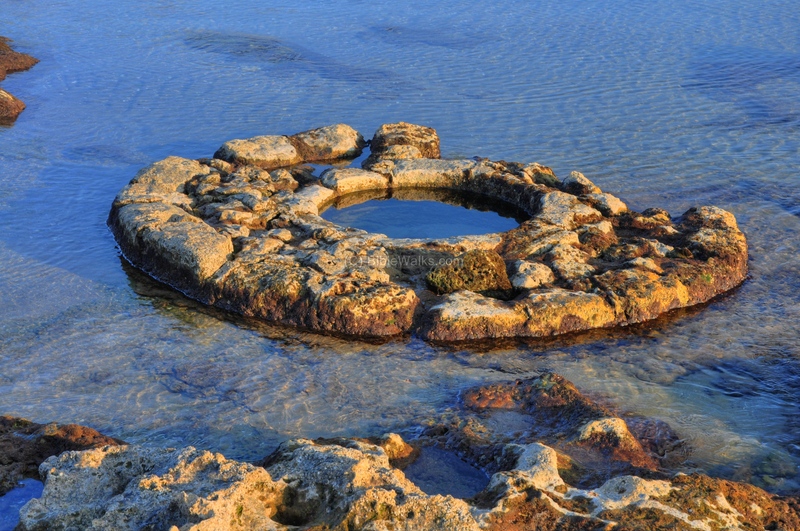 There are also ancient installations in the islet, being the closest to Tel Dor. 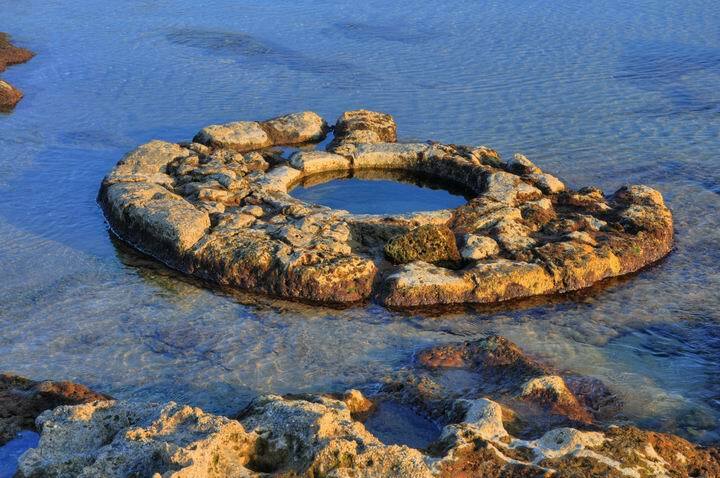 This installation in the following picture, submerged in the sea, is the top of an ancient well. The well may have supplied fresh water to a dye color industrial installation. 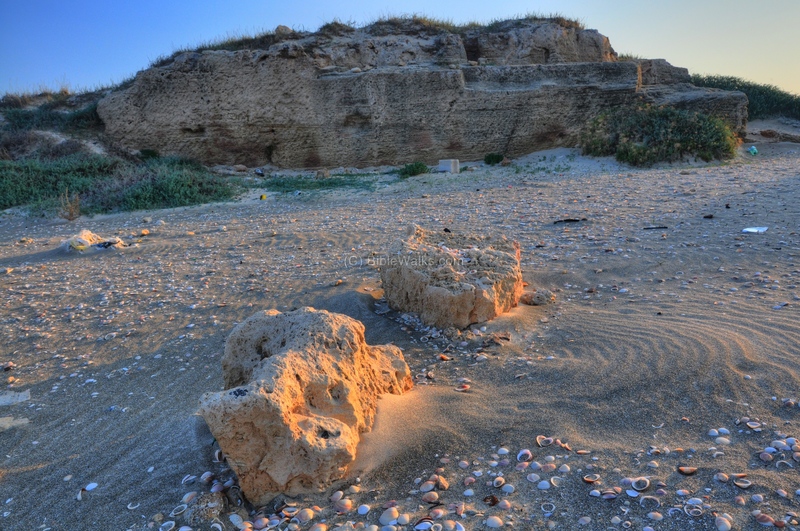 The medium-sized marine snail (Hilazon in Hebrew, Murex trunculus as scientific name), which was found along this shore, was one of the important sources of dye colors in antiquity. The Canaanites, Hebrews of the Zebulun tribe, and especially the Phoenicians produced the deep-purple indigo dye which was used for the textile industry and became a symbol of status, sovereignty and power. The first stage of the extraction of the dye used salt water, while the second phase required fresh water. A view towards the southern side is seen below. The resort hotel and beach of Dor is seen on the left background, and behind it are the western foothills of Mt Carmel. On the right background are the tiny islets of Dor, Tefet and Hofmi. Another view towards the southern islets is seen below. 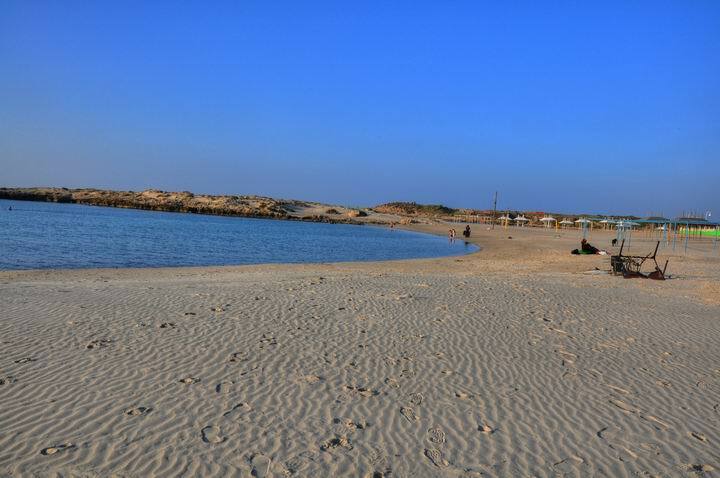 They are natural barriers that shield the beaches from the open sea, making the beach a perfect place for swimming. There are several pools inside the sandstone ridge, as seen below. A walk on the islet is a magical tour through nature's art museum. If you want to energize - come and enjoy the great sights. 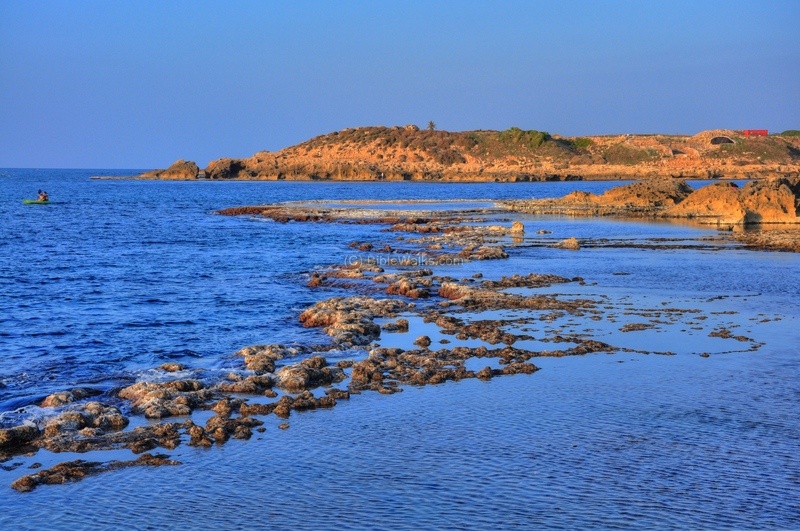 The west side of the islet faces the open Mediterranean sea. 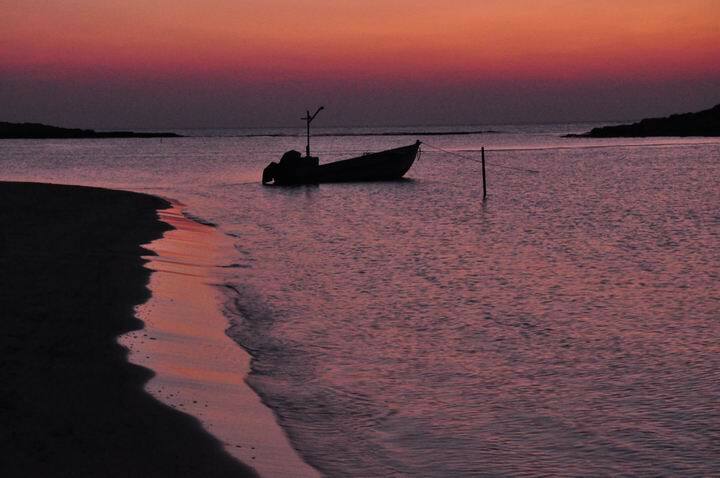 Fishermen, like the couple in the photo below, use this side to catch fish in deeper waters. 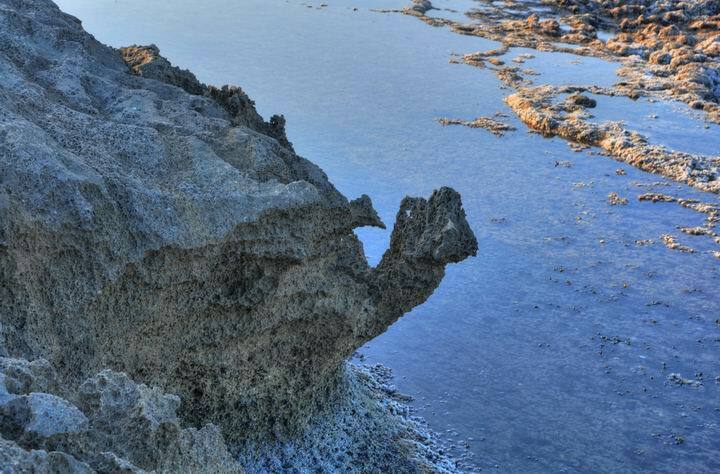 The sandstone formations create natural sculptures, such as the turtle (or camel) which is seen below. 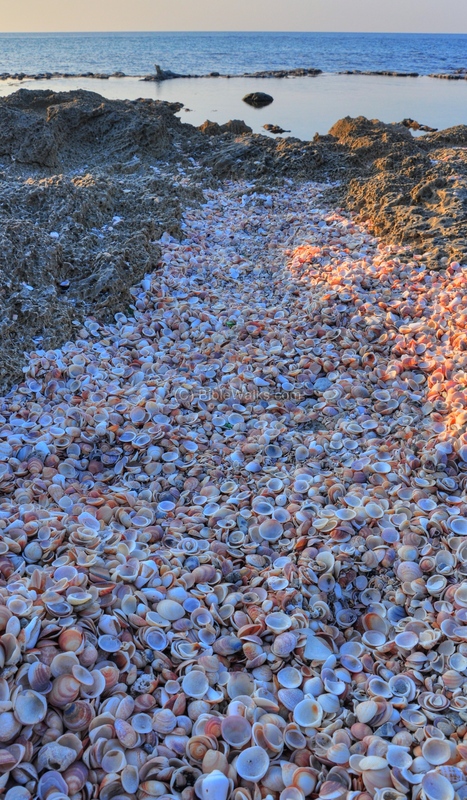 A pile of thousands of sea shells accumulate in this section of the rock. Why were they all assembled in this spot? 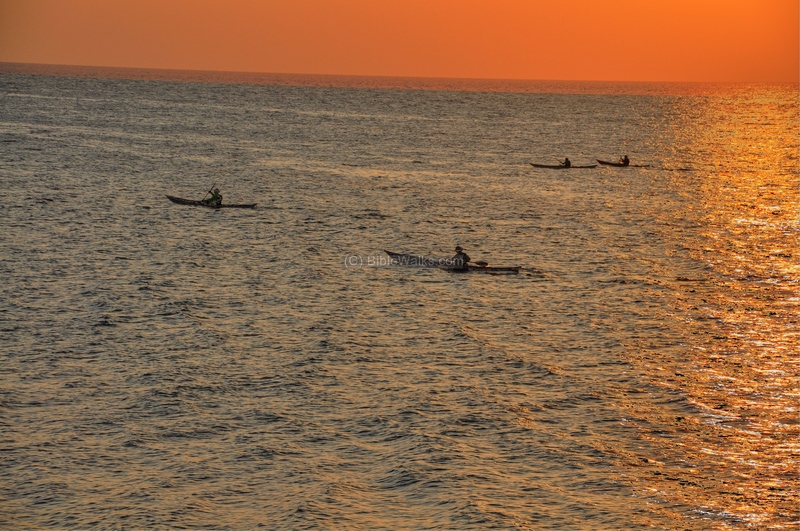 In the sea, a group of kayaks return back to their base in the Dor marine sports club during the sunset. 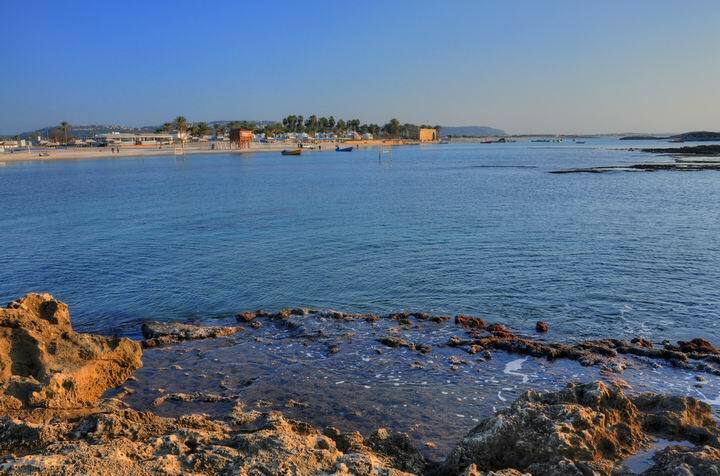 The north side of the islet shares the bay with Tel Dor, the ancient marine city. The bay was used for anchorage of the ancient vessels, and the harbor's quay was found along the shore of the city. The entrance to the bay may have been artificially deepened in order to let larger vessels enter into the harbor. Dor (Dora) had two additional harbors, making it one of the most important marine cities in the region. On the east side of the islet is a sandstone quarry, which was used to cut building blocks for the old city. 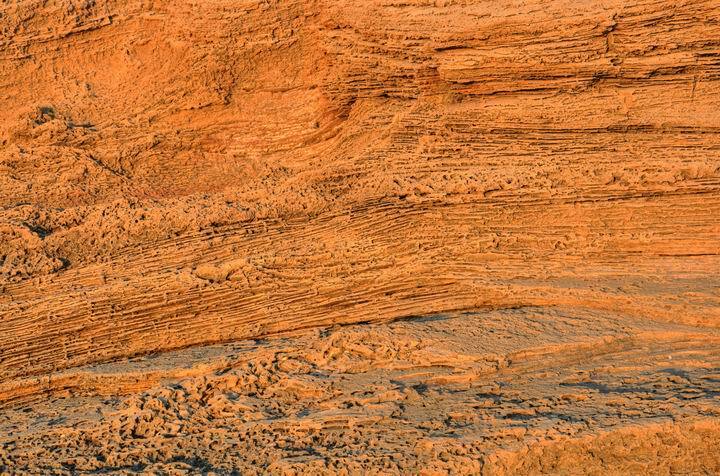 The structure of the sandstone (Kurkar) is composed of multiple layers of yellowish stone. 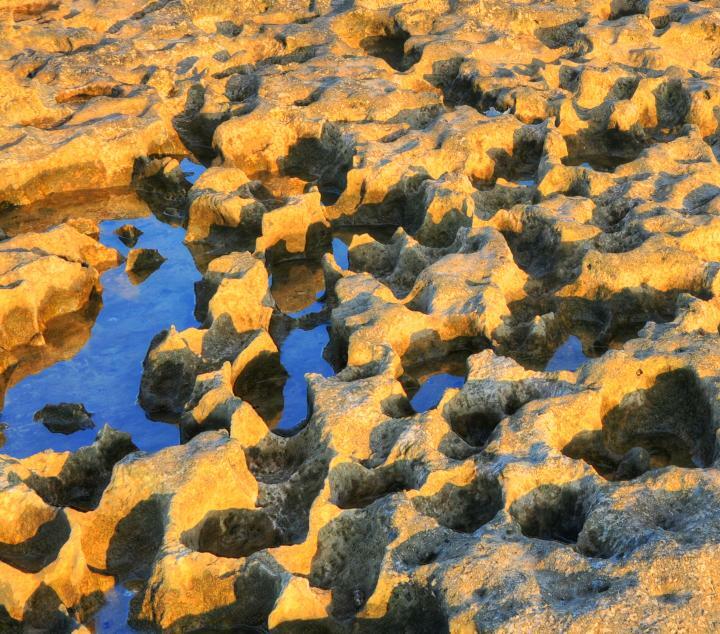 The stone was created by sedimentation - the sand in the bottom of the sea accumulates on a layer, is cemented together and pressurized by the layers above it. 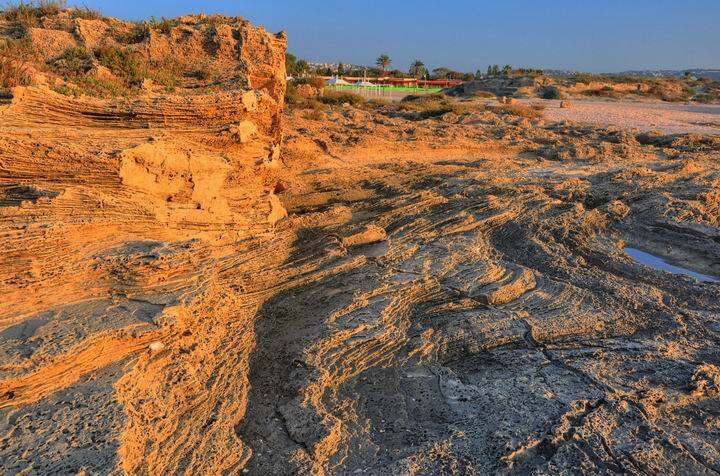 Another view of the waves of sandstone formations is seen below. The ancient sandstone quarry is seen below, which looks like a Japanese "dry landscape" garden. 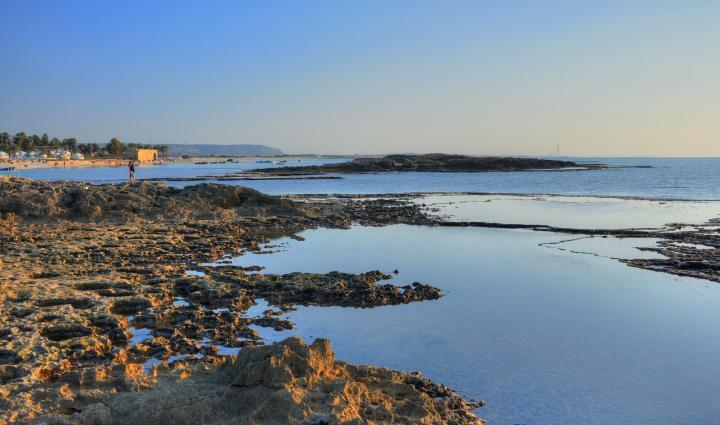 The south of the beach of Dor is seen in the photo below, with the Dor and Tefet islets in the background. Fishing and sports boats anchor in the bay. A kayaking club is also stationed in Dor. 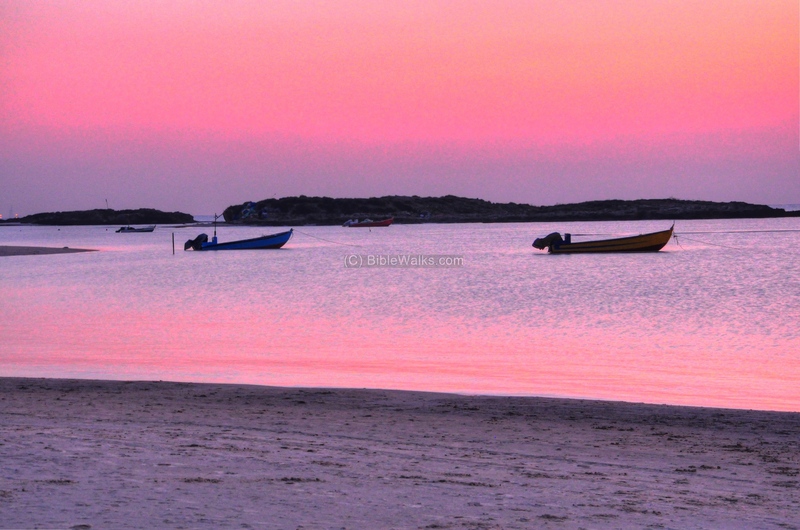 The photo below shows a sunset scene. Another sunset scene is seen below. Visit Tel Dor web page - "Ruler of Seas"
Islet, Isle - a small island. The English word (i-land) may have been based on the Hebrew word (pronounced "ee"). It appears in the Bible (Isaiah 23 6): " Pass ye over to Tarshish; howl, ye inhabitants of the isle". Dor - a modern Moshav, named after the ancient city. Located near the beach, and founded in 1945. Nachsholim - Hebrew: breakers, large waves. the name of the Kibbutz on the western side of the mound. Founded in 1948. Tantura - the Arab village south-east of Dor. It was destroyed in 1948. Means in Arabic - pointed hill, named after the acropolis of Dor.